Tablets integrated into vehicles from BMW, above, and Audi, bottom, have charging docks and can tap into a car's electronics. 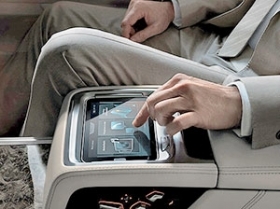 With more people bringing tablets into cars for entertainment, BMW and Audi designed their own. Here are 3 things automakers' tablets can do that an iPad cannot. 1. Keep people safer in crashes. BMW and Audi's tablets can be secured in charging docks, which prevent them from becoming projectiles in a crash. Their screens are made from the safety glass used for windshields to minimize shards. 2. Work in extreme conditions. Ordinary tablet computers won't work if they get too hot or too cold. Audi used automotive-grade electronics designed to work from minus 44 degrees to 185 degrees Fahrenheit, so its tablet can be left in a car year-round. 3. Tap into the car's electronics. Automakers won't let just any tablet connect to the electronic architecture of their cars. That would pose risks for security and privacy. But these tablets can control the car's navigation, entertainment, seats etc. "We want to stay on the cutting edge. With innovations continuing to improve tablets, we have to improve how our systems work in the car." It might seem strange that BMW's redesigned 7-series sedan, priced at $81,300 plus shipping, would have to compete with a $499 iPad from Apple. But that's exactly what's happening, as automakers realize that their cars are being compared not only with other cars but also with devices brought into the back seat. An estimated 259 million tablets will be sold globally in 2016, topping sales of traditional PCs and laptops for the first time, according to consultancy Gartner Inc. Many of those slim, handheld screens will be used as onboard entertainment for restless children in minivans or bored executives in chauffeur-driven cars. This is a real challenge for automakers, which have sold flip-down TV screens as lucrative add-ons for decades. To protect that business -- as well as the primacy of their brands -- luxury car manufacturers are beginning to offer tablets that are more integrated with their cars than any iPad. Audi plans to sell a tablet bearing its four-ringed logo in the redesigned Q7 crossover later this year. 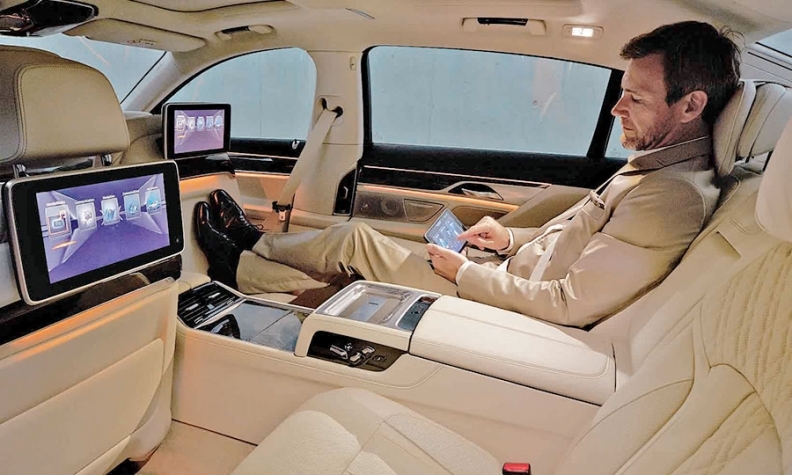 BMW designed a charging dock for a customized tablet into the back of its redesigned 7 series, offering the tablet as part of a $2,700 entertainment package or a $3,900 comfort package that includes massaging rear seats. "We want to stay on the cutting edge," Jason Chan, a product planning specialist at BMW of North America, said in an interview. "With innovations continuing to improve tablets, we have to improve how our systems work in the car." BMW designed a charging dock for the back of the 2016 7 series. The tablets look and work like regular tablets. 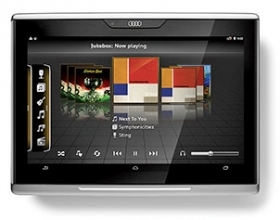 They use Google's Android operating system, the most popular interface worldwide for tablets. They can download apps from the Google Play store. They can connect to a car's dedicated Wi-Fi connection, allowing a passenger to watch streaming video or surf the Internet. However, they also tap into a car's electronics, allowing a passenger to assist the driver by programming a destination into the car's onboard navigation system. BMW's tablet lets a sleepy passenger close all the window shades by pressing one button. The automakers took pains to design their tablets to their own specifications. Audi's tablet has a screen made of automotive-grade safety glass, which means it won't break into dangerous shards if the car crashes. While an ordinary tablet left in a hot car may overheat, Audi's tablet uses more robust electronics that work from minus 44 degrees to 185 degrees Fahrenheit. It remains unclear how quickly the tablets will roll out across the lineup. Audi and BMW haven't committed to offer them in any models besides the Q7 and 7 series. They point out that tablets, which can be replaced quickly and cheaply, present a way to prevent rear-seat entertainment systems from becoming obsolete. But outside the luxury market, it could be a tougher sell. "People in the minivan set are willing to buy Velcro straps and hook something onto the back of the headrest," said Danny Shapiro, senior director of automotive at Silicon Valley chipmaker Nvidia Corp., which made the processor for Audi's tablet. "For this to become part of the minivan culture, the price point is going to have to go down."